Stunning in their brilliant yellow color, the golden conure (or Queen of Bavaria conure) is, without a doubt, a beautiful bird. They can also make a very nice and affectionate companion pet who is spunky, smart, and entertaining, though they are rare and expensive. One thing is for sure—these are very special parrots who seem to steal the hearts of every bird owner they meet. Native to northeastern Brazil, golden conures are only found in a small area south of the Amazon River. Spotting wild golden conures is difficult—despite their color—because they are not especially social and rarely form flocks. This means that their life in the wild is relatively unknown. It's believed that they are nomadic, moving from the lowland humid forests to the tall trees of terra firma (lands that don't flood), then to clearings during the breeding season. These birds have been on the endangered species list since 1975, and their small population contributes to the lack of sightings. While it's been accepted for some time that fewer than 3,000 goldens were left, a 2016 ICUN update says that this was an underestimate. It is now thought that the population is anywhere from 6,600 to 13,400 birds. This realization has not quelled fears of the bird's endangered status, though. It's projected that the population will continue to decline due to habitat destruction and illegal trapping, including taking babies from the nest. Captive breeding programs are a big focus for this species and take a priority over selling them as pets for many breeders. A large conure, at maturity the golden conure reaches a length of around 14 inches from the beak to the tip of the tailfeathers. They typically weigh about 8 ounces. 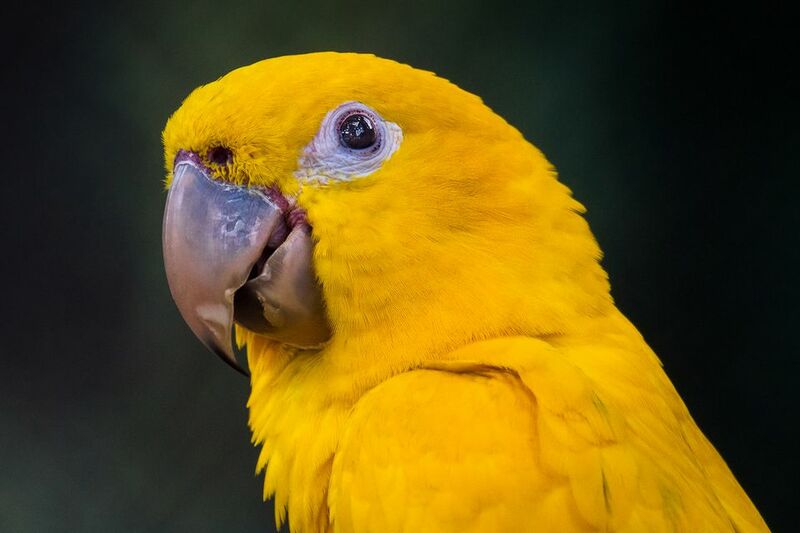 Most estimates for the lifespan of captive golden conures range 20 between 30 years. This is highly dependent on the quality of care and diet the birds receive. Golden conures are active pets that love to climb, chew, and play. Owners must be diligent to supervise these birds when out of the cage to avoid accidents due to their overwhelming curiosity about the world around them. Being a conure, these birds are very vocal and can produce loud screams, making them a poor choice for those who live in apartments or condominiums. The can, however, develop a rather extensive vocabulary. Golden conures are highly intelligent and need plenty of mental stimulation in order to prevent boredom and destructive behavior patterns from setting in. In this regard, it's slightly more sensitive than many other parrots. While feather plucking is often a warning you'll hear with neglected or bored parrots, it's stressed even more with golden conures. They seem to be especially prone to this self-destructive behavior, but it can be prevented. They really do require tons of attention and distractions and should feel like they have a certain amount of freedom. In general, golden conures do make great pets. They enjoy cuddling and are receptive to multiple people when socialized properly, so they do well with families. Aggression is typically not an issue except when they're breeding. Golden conures are often mistaken for macaws because of their larger head and beak. The tell-tale difference is that the conure's tail is much shorter than what you'll find on macaws. Mature golden conures are a bright yellow color all over their bodies. The only exception is the tips of the flight feathers, which are dark green in color. They have a bald ring around their eyes, horn-colored beaks, and pink legs and feet. Juvenile golden conures can be identified by green speckles in the yellow plumage of the body. Golden conures are affectionate, beautiful, and intelligent, making them excellent pets. Unfortunately, they are rather expensive and nearly as rare in captivity as they are in the wild. They can be quite hard to find as their sale is heavily regulated both in and outside of the United States. Don't worry, though, if you have your heart set on owning a golden conure, it is possible. You may just have to jump through some hoops to make it happen. For example, you and the seller will both need a permit from the U.S. Fish and Wildlife Service in order to purchase a parrot from another state. Do plenty of research on what's required before you adopt. To locate a golden conure breeder, a great place to start is Bird Talk Magazine's Breeder Directory. If and when you are able to locate an available golden conure, you will be rewarded with an incredibly entertaining and interactive pet. Owners report that their birds have been able to learn many fun tricks, develop impressive vocabularies, and even seem to speak in context at times. It's important that your bird does not feel confined most of the time. The golden conure's high energy level needs to be taken into account when selecting a cage. It should be large enough to give him room to roam, climb around, and burn energy. They rarely fly in captivity but that doesn't mean these acrobats will be happy in a smaller dwelling. Golden conures in the wild normally feast on a varied diet of fresh fruits, vegetables, nuts, berries, and grain. Feeding an equally diverse diet is best and will ensure your bird remains healthy. It should consist of fresh foods like fruits, nuts, berries, and vegetables, along with high-quality commercial pellets. This combination will ensure that pet conures receive adequate nutrition. Being active birds, golden conures require quite a bit of exercise in order to maintain top physical condition. Those who would like to own a golden conure should make sure that they can spare a minimum of three to four hours a day supervising their bird during out of cage exercise and play time. Golden conures love to climb, and seem to appreciate toys like ladders, ropes, and swings that give them something to "navigate." A play stand is also necessary to give the birds a sense of freedom out of the cage while having a home base that's filled with toys to occupy their time. They're quite comical in these playful adventures and will often seek out your attention. These birds are also heavy chewers who need to exercise their strong jaw muscles. Golden conure owners quickly learn to provide their pets with plenty of chew toys in order to spare their own belongings! Wood will be your mainstay as it's easily replaced, though leather, rope, and beads will also be appreciated. International Union for Conservation of Nature and Natural Resources (IUCN). Guaruba guarouba. 2016.